Mauldin was the featured speaker, though Norris, who was a featured speaker last month at the Democratic Committee meeting, also was given time to make his appeal for support. The Democratic Party members considered but did not endorse candidates in the race between Mauldin and Norris or in the race between Lisa Lott and Regina Quick. Lott and Quick are seeking the seat now held by Quick. Less than 10 percent of Oconee County’s registered voters cast a ballot in early voting, which ended on Friday. The figures suggest turnout will low when voters who cast a ballot at polling places on Tuesday are added. The election on Tuesday includes both the nonpartisan General Election for the two local judgeships and a list of state-wide judgeships. It also includes primaries for the Democratic and Republican parties. Since Georgia does not provide for voters to register by party, individual voters simply request the ballot for the party of interest. So far, in early voting, 1,967 voters (72.5 percent) used the Republican ballot, 730 (26.9 percent) used the Democratic ballot, and 16 (0.6 percent) asked only for the judicial ballot, which also is given to all voters regardless of primary ballot selected. In the comparable primary ballot in 2016, only 4.7 percent of Oconee County voters cast their vote using the Democratic ballot. Lott, Mauldin and Norris have made multiple visits to Oconee County Democratic Committee meetings in recent months. Mauldin told the gathering on Tuesday night that one of the reasons she decided to run was because both Norris and Quick have been appointed by Republican Gov. Nathan Deal after judicial review. Ken Mauldin attended the Oconee County Democratic Committee meeting on Tuesday and said he would step down if his wife is selected to the Superior Court. Mauldin, currently is chief assistant district attorney for the Ocmulgee District. She is based on Greene County, but she said she in involved in Athens-Clarke County and knows Oconee County as well. Mauldin criticized what she call current practice of moving hearings from one county to the other to accommodate the scheduling of space and of the judges. She said this movement consumes time, particularly of the Athens-Clarke County Sheriff’s office, and wastes money. All of the parties–victims, defendants, families of those involved and the public--have to move for these hearings, Mauldin said. Since Oconee County does not have public transit, she said, this movement is very difficult for many of those affected by the hearings. All four of the judicial candidates running in the May 22 election spoke at a judicial forum at the University of Georgia last month. 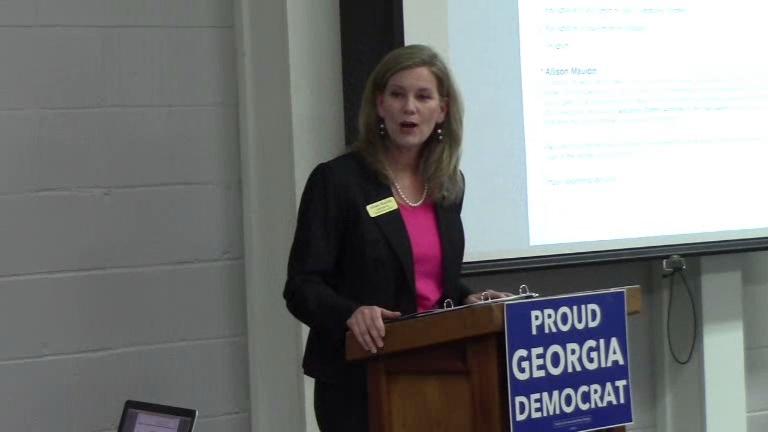 And Norris spoke before the Oconee County Republicans on March 26. The election on Tuesday is final, and the successfull candidate will assume a full four-year term in January. No Democrat qualified for the Oconee County Board of Commissioners posts that are up for election this term. Incumbent William “Bubber” Morris and John Laster have qualified for the Republican primary for the Post 2 position and are facing off on Tuesday. Post 2 Board of Education member Amy Parrish and Adam Spence qualified in the Republican primary, also to be settled on Tuesday. Steven Strickland and Marcus Wiedower also are on the Republican ballot, seeking the party’s nomination for the Georgia House District 119 seat now held by Jonathan Wallace, a Democrat. Most of Oconee County falls in the 119th District, with the remainder falling into the 117th House District, where there is no primary competition in either party. During the business meeting that followed the candidate introductions and presentation, Party Chair Angela Eells asked if there was interest in endorsing a candidate in either of the two nonpartisan elections. Party bylaws allow for that type of endorsement, Eells said. No one spoke in favor of making such an endorsement, and the question died for lack of support. Several questioned the effectiveness of the endorsements. Twenty-nine people attended the meeting, held in the Chamber of Commerce auditorium in Watkinsville. I was not able to attend the Democratic meeting because of medical treatment I am undergoing, but Tony Glenn did attend and recorded the video below. Norris began his comments at 2:01 in the video. Mauldin began her comments at 11:10 in the video. The discussion of possible endorsements is at 53:54 in the video. A rough cut appears late in the video when Glenn switched batteries in the camera. OCO: Oconee Democrats 5 16 18 from Lee Becker on Vimeo.